The government has given the go-ahead for the testing of driverless cars on public roads. Three consortiums will carry out tests of various technologies and vehicles in four locations across the UK: Greenwich, Milton Keynes, Coventry and Bristol. The RAC Foundation is a member of the advisory group for the GATEway project – led by TRL, the Transport Research Laboratory – which is running the trials in Greenwich (GATEway press release below). “These trials are not just about harnessing technology to make our travelling lives easier and safer, they also involve getting the regulation right. But while the increase in personal mobility is a positive element of autonomous technology this could actually lead to more vehicles on the road. 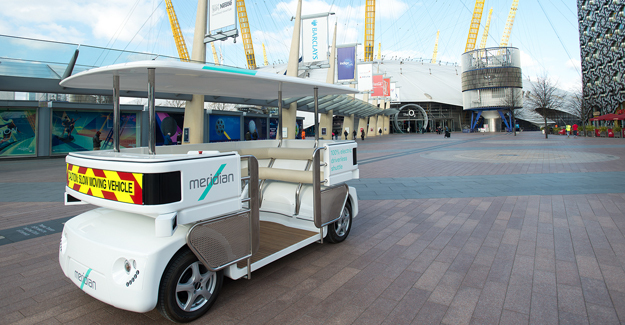 The GATEway project includes the testing of a fully driverless vehicle named the Meridian Shuttle, which will be evaluated in various scenarios over the next two years. This morning (Wednesday 11 Feb) it will take its inaugural journey at Greenwich Peninsula. The GATEway project is made up of a consortium of eleven members, led by TRL, the Transport Research Laboratory along with key partners including the Royal Borough of Greenwich, which is the location for the trials. Other key consortium members include RSA, the global insurer, who will be looking at how automated vehicles might impact the motor insurance market, Shell and Telefonica who will be learning how the technology might impact their sectors and the University of Greenwich who will be researching how people might interact with driverless vehicles. TRL (Transport Research Laboratory), the project lead. TRL provides independent and impartial world-class research, consultancy, testing and certification for all aspects of transport. TRL has been innovating in automated vehicle research for more than 50 years. Royal Borough of Greenwich, the Local Authority and Smart City partner, provides the venue for the trial. The Royal Borough of Greenwich is undergoing substantial regeneration and has well-used roads, extensive segregated bus and cycle lanes, London Underground, Thames Clipper river-bus and Emirates Airline cable-car stations and the world’s most successful entertainment arena. This ensures a diverse ‘real world’ test environment for automated vehicles, which is critical to understanding the how driverless cars can be integrated with other forms of transport and in helping place the UK at the forefront of the development and adoption of this technology. RSA will be working to understand how automated vehicles might impact the motor insurance market and will support the project’s risk mitigation strategy. Shell and Telefonica will be contributing their expertise to the project and learning how automated vehicles could change their existing business models. The Royal College of Art will be drawing from their internationally recognised expertise in stakeholder engagement in relation to vehicle design to provide detailed insights into stakeholder attitudes to vehicle automation. Imperial College London will be considering the cybersecurity implications of the specific trials and the wider implementation of connected, automated vehicles. Phoenix Wings is providing the automated vehicle technology, drawing on the expertise that delivered the world’s first commercially available driverless shuttle vehicles. Commonplace will provide innovative sentiment mapping techniques that analyse social media to measure users’ responses to the experience of automated vehicles. Gobotix, a consultancy formed by engineers trained at the University of Oxford who will be delivering the demonstrations of vehicle teleoperation and support to the automated vehicle trials.